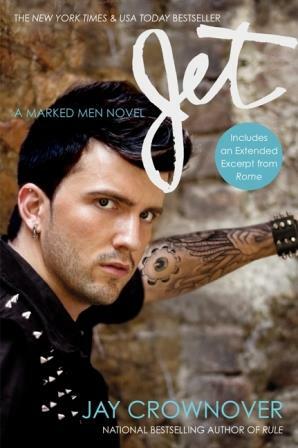 After meeting Jet and Ayden in Rule, I was eager to find out how Jay Crownover would shape their story and I wasn't disappointed when I had the chance to sit down and read Jet! This story unfolded slower than the first book in the series and I was on the cusp of being a little let down by the lack of action in the book when it all caught up! If you are looking for the typical Alpha Male that Rule was in the first book, you may be a little disappointed, because Jet is much more sensitive and the relationship is completely different - that said, in a lot of ways, I enjoyed this book more! It still packs a punch, but takes more time to explore the ups and downs of the relationship between Jet and Ayden and and their histories! I really love how Jay interwove Ayden's past and present into the story and helped develop both the character and the romance - and I have to say that Ayden is one of my favorite characters so far! Of course, that means that I have to get my hands on Rome - the third book in the series, which comes out in print in January! If you are looking for a great read with a sensitive hero, a strong heroine and a great storyline, then you should definitely pick up Jet by Jay Crownover!